If you are part of the Starbucks Rewards program, check your email or your smartphone notifications or the inbox in the Starbucks app (make sure you have the latest version). 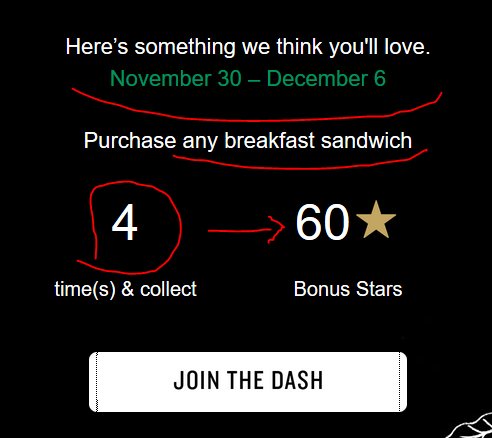 There is an offer that gets you 60 Bonus Stars (that’s almost half a reward) if you purchase four breakfast sandwiches between November 30 and December 6, that’s a seven day period. This offer needs to be activated first, so make sure you press the “Join the Dash” button in your email or activate it in the app (if available there). NOTE: some of these promotions are only offered to a subset of Rewards members. I can only see the ones in my account, and I have no way of knowing whether everybody or only a subset of members get these offers. So YMMV until you check. The offer is one time use, meaning the maximum you will receive from this is 60 Bonus Stars, even if you buy five or more breakfast sandwiches. The bonus stars will load up in your account by 12/13/16. You can track progress using the latest Starbucks apps (it’s actually pretty nice; I’ll post a screenshot after I put mine to work). 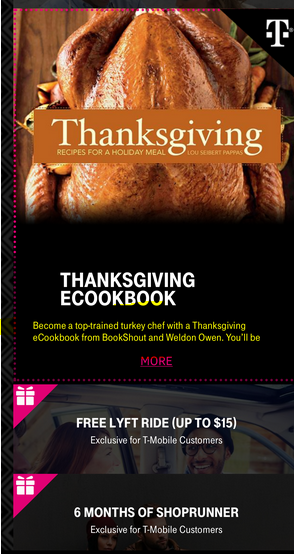 T-Mobile Tuesdays are getting into the Holiday spirit with the November 29 (2016) round of Tuesday freebies. The headliner is a $5 donation match to the “Boys & Girls Clubs of American”. You donate $5, T-Mobile donates $5 to match your donation.. 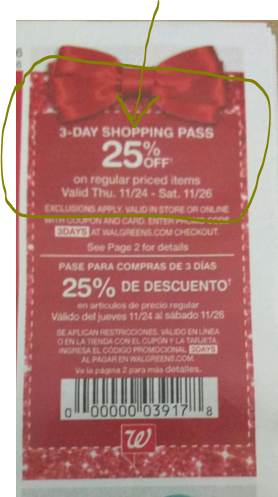 While CVS and Rite Aid are fighting tooth and nail with ExtraBucks and Plenti promotions respectively, Walgreens is once again almost sitting out Black Friday, except for one coupon! It is a “Pass” so you can keep bringing it back until Saturday night, and it gets you 25% off all the regular prices items. So this is great if you have favorite items that are rarely discounted. 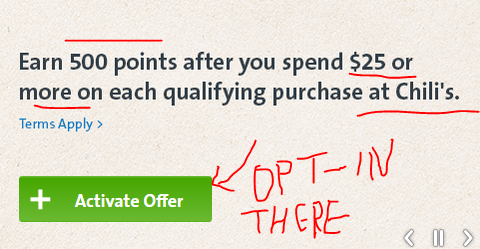 Of course the usual exclusions apply to the coupon (no gift cards, no stamps, etc). 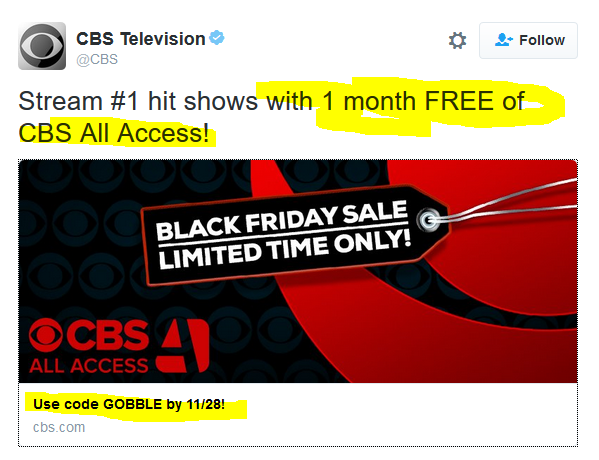 In time for the Black Friday madness, CBS All Access is offering a 1-month FREE TRIAL to its streaming service when you enter coupon code GOBBLE over there by November 28 (2016). The coupon for the ad-based tier (the “Limited Commercials” euphemism). CBS All Access will be (other things equal) the home of the new “Star Trek Discovery” TV series, along with the “The Good Wife” spin-off/sequel series. This is month to month, so you can sign up only when your favorite shows are running. In addition to the previosuly mentioned 20% off purchase promotion, Google Play is also running another promotion you may see in your emails or while browsing around their website or Store on an Android device, you get 50% off when you rent a digital movie of your choice. Strategically this is a great promotion for newly released movies which have insane rental price of up to $6 or $7. The offer ends 1/22/17 if not used. 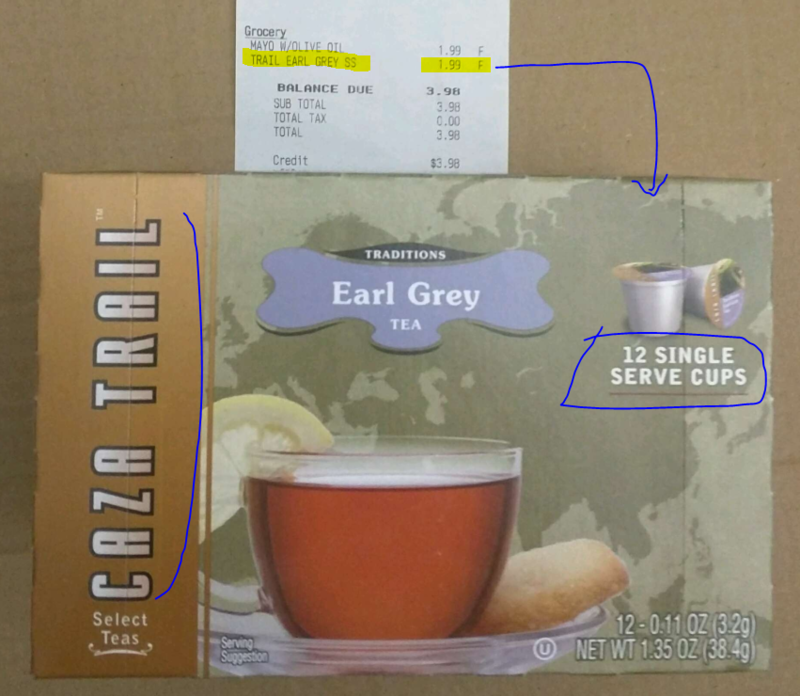 If you live near a Grocery Outlet and like to drink tea from K-Cups (I hope the tea purists are not reading this post), they currently have 12-packs of Casa Trail K-Cups on sale for $2 per dozen. The flavors include Green, Breakfast (black tea), and the popular Earl Grey (pictured below). I just bought this, I haven’t tried it yet, I’m re-arranging kitchen and the machine that makes K-cups is not within reach). 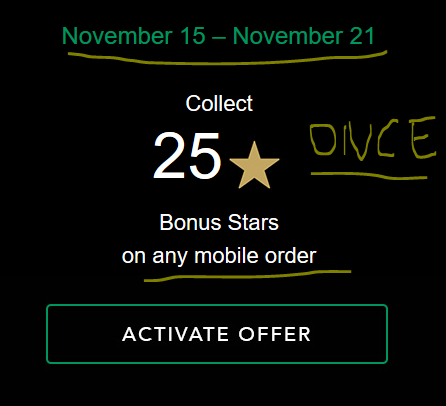 … AND you manually activate it clicking on the link in your email or app, you will receive 25 bonus stars when you place a mobile order between November 15-21 in 2016. You only get one bonus for this promotion regardless of how many orders you place. You can also stack this with the after 2PM promotion. PS: you can place a mobile order while you are in the store, or even while you are in line (eg the line is way too long, so instead of wasting time in line, you sit on a chair, place a mobile order and wait for it to get called). The clues are hard to decipher because we don’t know if we are supposed to read into them or not. This is not LOST or Westworld after all 🙂 For example, it says “in store”, is that a hint that the offer will be in their brick and mortar stores only? Or is it just a phrase? 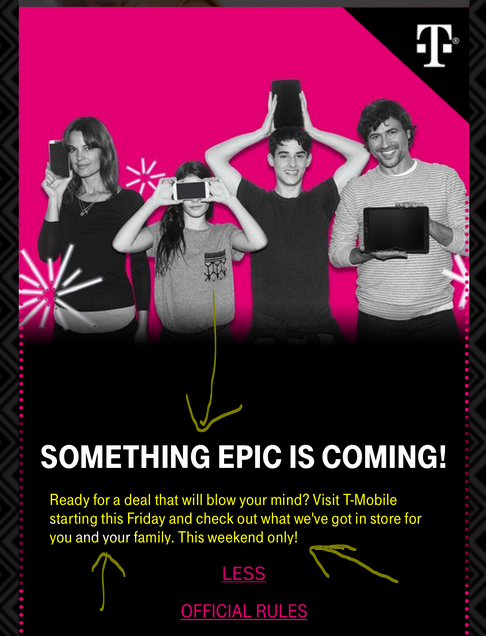 There are buzzwords of “epic” and “blow your mind”. Is that a phrase or a hint of something audio-related (the blow your mind part)? The pictures show people with smartphones and tablets, the smartphones taking pictures, the tablets are not. Will it be photography related? Will it be a service discount or a limited time new or upgrade plan or a buy new devices promotion? Last but not least of the options ~ because they did it in the past ~ they were giving away free products to people who walked in the stores. Of course by the time this made the news (various blogs and deal websites and forums), most of the stores ran out. Starbucks launched a new Bonus Stars promotion. 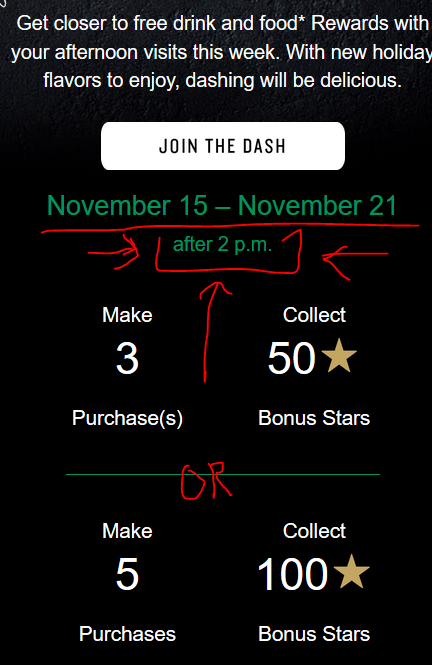 Check your emails or the latest version of the Starbucks app, as some of the Bonus Stars offers (but not all of them) have began showing up in the app. This offer requires manual opt-in, which boils down to clicking the “Join the Dash” button in the email or the appropriate button in the app. This offer is to encourage afternoon visits. You only qualify for the bonus for purchases made after 2pm local time between November 15-21 in 2016. If you make three purchases, you will receive 50 Bonus Stars. Or if you make five or more purchases, you will receive 100 Bonus Stars. You can only get one bonus for this offer. The bonus stars will be added to your account by 11/28/16. The email does not clarify what they mean by “purchases”. I am assuming they mean separate transactions, not visits, not individual items counted. If so, strategically, you can split your order if you are going to be “for here” ~ if you are going to be too close to call. But if you are there daily after 2pm, you can get to the bonus without effort, since the promotional period is seven days. How metal are you when it comes to tea? If you prefer to brew your tea in an iron tea pot, we have some great news for you! The lavender color scheme of the 26oz Old Dutch Cast Iron Placidity Teapot is currently on sale for $13.64, in new condition, at Amazon by Amazon actual with a limit of three units per customer. Per the listing there, this does not come with a warranty, so make a note of that. Amazon’s return policy still applies, so if you have issues with it during Amazon’s return window, proceed as usual. If you have issues after that, still contact Amazon customer service, they may still be able to help. It depends on how flexible they can be since they want to known as customer-friendly (that’s the whole reason they bought Zappos to acqui-hire their “customer happiness” approach). A total of 30 models are listed on the same page. To find reviews for this model, you have to drill down on the reviews. Here are the links of the 30 reviews for this particular model. You can also check the reviews of the other 26oz models that are different colors/design of the same model. NOTE: This is enameled inside, so it is designed for brewing tea, NOT boiling water. If you want an iron kettle for boiling water, look for non-enameled ones. Let me repeat, this is NOT designed to boil/heat water, it is designed to brew tea. Look at the design, if you boil water in this , it will spit out of its nose while it’s heating up. More Plenti action, this offer is running until 11/17/16 and has to be manually activated (the green button over there). 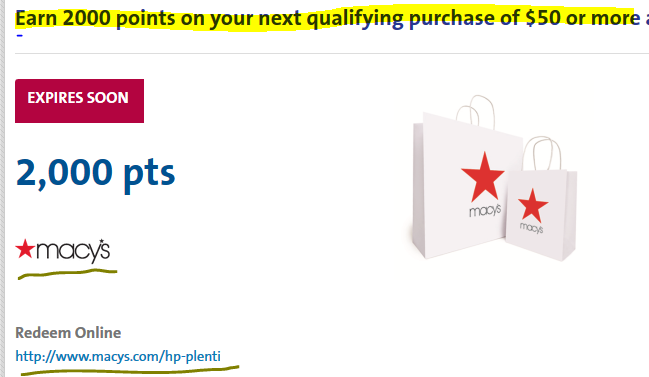 You get 2000 Plenti points ($20 future buying power) when you make a purchase of $50 or more at the Macy’s website. Check your Plenti account for all the terms and conditions. Assuming you’ll spend your 2000 Plenti points wisely, this is effectively a 40% off discount on your Macy’s purchase. They are already running some specials on their own when you add beauty items to your cart, so if you are strategic about it, you can score big. Once activated, the offer continues until 12/5/16. Check the full terms over there, alcoholic beverages are not eligible for this promotion, neither are taxes or tips. You have to get to $25+ with food items only. You can use it multiple times during the promotional period but once per transaction. NOTE: You have to show them your Plenti card or give them your phone number in order to get the 500 Plenti points!